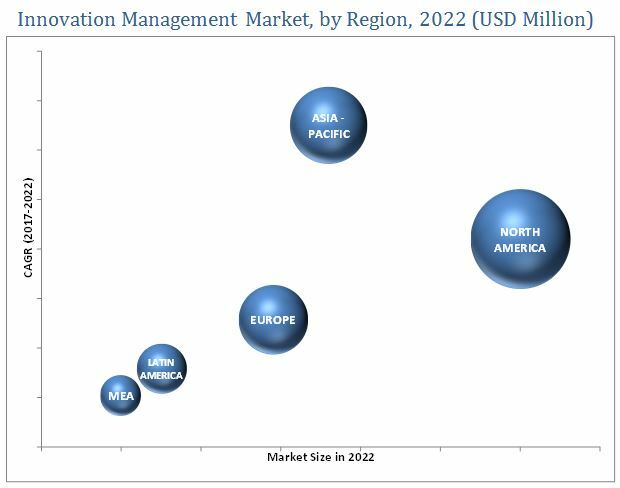 [145 Pages Report] The Innovation Management market is projected to grow from an estimated USD 421.6 Million in 2017 to USD 1,519.2 Million by 2022, at a Compound Annual Growth Rate (CAGR) of 29.2% during 2017–2022. The innovation management ecosystem includes technology vendors such as Qmarkets (Israel), BrightIdea, Inc. (U.S.), Imaginatik Plc (U.S.), Hype Innovation (Germany), IdeaScale (U.S.), Innosabi GmbH (Germany), Cognistremer (Belgium), Crowdicity Ltd (U.K.), Planbox, Inc. (Canada), Spigit, Inc. (U.S.), Exago (Portugal), Inno360, Inc. (U.S.), and SAP SE (Germany), among others, which provide numerous IT and non-IT components required in the innovation management market. These Innovation Management Software Vendors are rated and listed by us on the basis of product quality, reliability, and their business strategy. Please visit 360Quadrants to see the vendor listing of Innovation Management Software. The Innovation Management Market is projected to grow from an estimated USD 421.6 Million in 2017 to USD 1,519.2 Million by 2022, at a Compound Annual Growth Rate (CAGR) of 29.2% during the period 2017–2022. The major drivers in the market include changing work cultures in different organizations, increasing demand for open or crowdsourcing innovations from various organizations, and increased focus of companies on the development of new and innovative products. The scope of this report covers the innovation management market by type, deployment mode, organization size, application, vertical, and region. The services segment is expected to grow at the highest CAGR during the forecast period. Service providers help in implementing intelligent platforms for the efficient operation and maintenance of any enterprise. The market for the on cloud deployment segment is expected to grow at the highest CAGR during the forecast period as it provides cost controls in terms of deployment, licensing, and maintenance, enforcement of security compliance and audit features, and enhanced speed workflow in organizations. The small & medium enterprises segment is projected to grow at the highest CAGR during the forecast period. SMEs are increasingly adopting innovation management solutions to develop innovative products to meet the changing requirements of their customers and face competition in the market. The collective intelligence & prediction platforms segment is projected to grow at the highest CAGR during the forecast period. Collective intelligence & prediction platforms are widely associated with crowdsourcing innovations to generate ideas. The healthcare & pharmaceuticals segment is expected to grow at the highest CAGR during the forecast period. The landscape of the industry has changed over the past few years, majorly driven by changes in consumer/patient demands and digitalization. These changes have challenged hospitals, pharmaceutical companies, and other healthcare businesses to think and act strategically about shaping their companies to meet the requirements of patients. 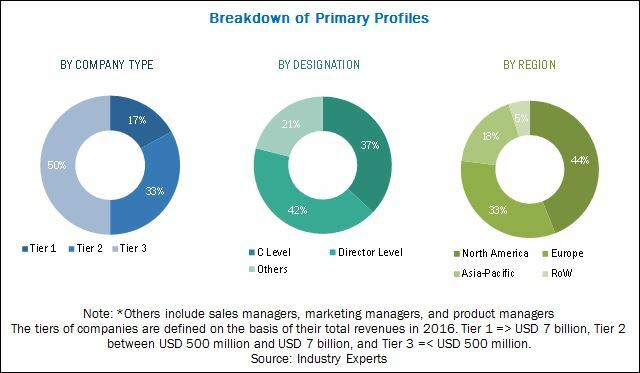 The innovation management market in North America is expected to grow at the highest CAGR and also hold the highest market share during the forecast period due to the high demand for innovation management solutions by end users in this region. The presence of key players in the market is expected to be a major factor driving the growth of the market in the region. A few restraining factors that affect the growth of the innovation management market include inefficiency of enterprises in tracking reliable Return on Investment (ROI) based on innovation management solutions and the limited availability of technically skilled personnel. Innovation management solution vendors profiled in the report include Qmarkets (Israel), BrightIdea, Inc. (U.S.), Imaginatik Plc (U.S.), Hype Innovation (Germany), IdeaScale (U.S.), Innosabi GmbH (Germany), Cognistremer (Belgium), Crowdicity Ltd (U.K.), Planbox, Inc. (Canada), Spigit, Inc. (U.S.), Exago (Portugal), Inno360, Inc. (U.S.), and SAP SE (Germany). *Details on Business Overview, Product Offerings, Business Strategies, Recent Developments, and Key Relationships Might Not Be Captured in Case of Unlisted Companies.